Welcome to Navona - Constantia Guest Cottage! This completely secure, 4 star, one bedroom (king bed) garden cottage, Navona Cottage is fully self - contained and secluded, with a private entrance and enviable panoramic views of the Constantiaberg mountains. It also has air-conditioning, secure parking and complimentary ADSL internet access and WIFI. 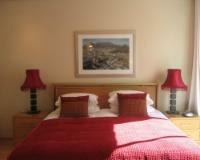 The cottage itself is modern and stylishly furnished, with a refreshing feel to its interior. Boasting a fully equipped, stoned-top kitchen with complimentary tea and coffee facilities, Navona Cottage also features a separate bathroom (bath with shower) with underfloor heating in the bathroom and heated towel rails, a diner and an entertainment area. A quaint courtyard with table, chairs and parasol can be accessed from both the entertainment area and the bedroom – an ideal spot for reading, relaxation, breakfast and sundowners – and the perfect place for leafing through the abundance of guidebooks and reference brochures available to the Cape Town visitor.Modern conveniences at Navona Cottage consist of a satellite TV, DVD and CD player and complimentary 24-hour ADSL internet access and WIFI. There is also secure parking within the property, in front of the cottage, for even more convenience and peace of mind. Other conveniences include air conditioning, heating, an electronic safe (which also accommodates a laptop), ironing facilities, an alarm clock, a hairdryer and a dishwasher. A washing machine and a tumble drier are also available. Daily servicing can be arranged at an additional daily charge. When you’re ready to leave the peaceful haven of Navona Cottage, you’ll find more than enough to see, do and enjoy in the surrounding area. The nearby Constantia Shopping Mall is a hub of urban activity, with a range of shopping, dining, craft and curio vendors on offer, and a selection of world-class wineries and restaurants only five minutes away.Its central location ideal for sightseeing, Navona Cottage is perfectly positioned for you to set out and explore Cape Town’s most famous attractions, such as the V and A Waterfront, Robben Island, Table Mountain and Kirstenbosch Botanical Gardens, to name but a few. Slightly further away lie the world-famous beaches of Camps Bay and Llandudno, as well as other treasures such as Cape Point, Cape Agulhas and the Stellenbosch, Franschhoek and Paarl winelands.But wherever you decide to go, make sure your starting point is Navona Cottage – the beginning of a truly sublime Cape experience. Golf: World class golf courses within a 15 - 30 minute drive from Navona - Constantia Guest Cottage. Romantic: Great for a romantic get away and / or honeymoon. Reservations must be confirmed in writing and accompanied with a 50% bank deposit / credit card deposit. The balance is to be settled by cash (Rands) or by credit card on arrival. If cancelled 1-14 days prior to arrival, the deposit will be retained. Full reservation value will be levied for same day cancellation or no... Reservations must be confirmed in writing and accompanied with a 50% bank deposit / credit card deposit. Full reservation value will be levied for same day cancellation or no show. Check in is after 15H00 and check out is before 10H00. Airport transfers can be arranged at a reasonable cost. Daily servicing can be arranged at an additional daily charge. Navona Cottage is pristine and had absolutely everything we needed. The Cottage is very and private, it has everything one can think of having, and more, for a self - catering unit.The facilities is immaculate, we could not find any fault. Navona - Constantia Guest Cottage is 2.5km from the centre of Constantia , the nearest airport 17.3km (Cape Town International Airport).